Turbocharged engines, impressive mileage with the turbocharged six-cylinder, loads of cabin room and luxury, ultra-comfy seats and a cool dual-action rear hatch/liftgate might win BMW’s 2011 5 Series Gran Turismo some new friends. Alas, a less-than-luxurious ride, smallish cargo area, and steep base price, not to mention stratospheric option pricing, may make some yearn for a more utilitarian crossover than the 2011 5 Series Gran Turismo. The niche-challenged 2011 BMW 5 Series Gran Turismo looks a tad different, but has enough techno-gizmos and posh cachet to earn the name “Beemer.” Although its handling isn’t up to 5 Series sedan standards and there are a couple of minor but annoying glitches with braking and acceleration, the Gran Turismo’s turbocharged powerplants, neat rear hatch/liftgate, and noticeably increased cargo capacity may result in a whole new luxury auto market segment. There seems to be some confusion in categorizing the 2011 BMW 5 Series Gran Turismo, leading most reviewers to render it a niche all its own. The dilemma is real enough, since this four-door, five-passenger hatchback/wagon/crossover has its roots in the 7 Series, yet suffers an inferior ride in comparison to Beemer’s top-shelf lineup, yet it also fails to approach the nifty handling of its 5 Series contemporaries. Nevertheless, this racy-looking automotive concoction, being some 4 inches longer than its 5 Series sedan siblings, offers substantially more passenger space and, at 60 cubic feet, considerably more cargo room. Unfortunately, that’s a bit less load area than your ordinary crossover, leading to speculation that with the Gran Turismo, BMW aims for the family that needs a bit more room for luggage or camping gear than the sedan provides as well as a bit more flaunting of the wealth than the run-of-the-mill crossover usually merits. And the unique dual-action hatchback can be opened either like a sedan’s trunk or a crossover’s liftgate, depending on whether one is loading groceries, coolers, tents or steamer trunks. 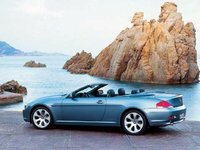 Whatever its future designation, BMW’s 2011 5 Series Gran Turismo, sometimes referred to as the GT for reasons of brevity, comes in two trim levels, the 535i and the 550i, with engine size being the delineating factor. Each is equipped with alloy wheels, a rear fixed sunroof and front power-opening sunroof, driver-selectable Adaptive Drive and that nifty dual-opening hatchback. Rear-wheel drive (RWD) is the standard drivetrain configuration, but both trims are available with full-time all-wheel drive (AWD), known as xDrive in Beemer-land. Though 2011 is the first year that the 535i Gran Turismo is offered with xDrive, the 550i has offered this traction-savvy AWD system since its inception in the 2010 model year. Additionally, Beemer’s standard iDrive shortcut-heavy electronics interface system has been tweaked for allegedly easier operation in 2011 versions, though the jury’s still out as to whether or not the fixes have worked. Otherwise, this hefty hatchback is unchanged from 2010. One thing about occupying a solitary niche is that competition can’t readily be identified, though Audi is making noises about offering a similar one-of-a-kind vehicle in 2012. For now, however, perhaps such luxury wagons as Audi’s A6 Avant and Cadillac’s CTS Sport Wagon, or posh crossovers like Accura’s MDX or Beemer’s own X5, might be worth a tire kick or two before putting down a considerable chunk of change on a 5 Series Gran Turismo. 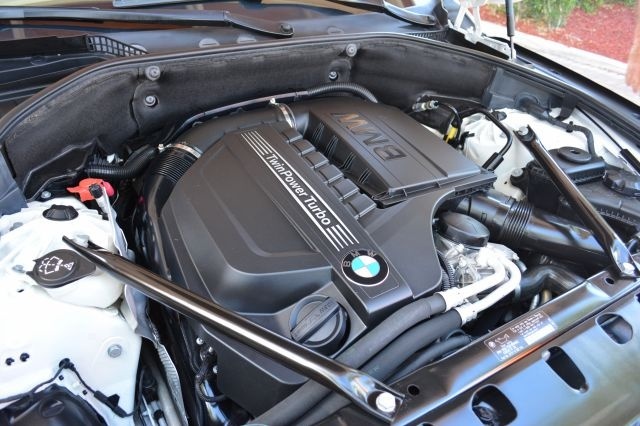 The standard powertrain for the 5 Series Gran Turismo 535i and 535i xDrive is a 300-hp (at 5,800 rpm) turbocharged 3.0-liter inline six-cylinder (I6) engine and 8-speed auto-manual transmission. Direct fuel injection helps the I6 throw down 300 lb-ft of torque at 1,200 rpm, and variable valve timing keeps estimated gas mileage at 20/30 mpg. Additionally, this drivetrain features a brake hill holder, as well as a limited-slip rear differential in the RWD variant, and limited-slip rear and center differentials in the xDrive configuration. Powering the 550i and 550i xDrive trims is a direct-injected 4.4-liter twin-turbo V8 engine that combines with the standard 8-speed auto-manual transmission for 400 hp and 450 lb-ft of torque. Though boasting variable valve timing, the V8 can be expected to achieve only an estimated 15/22. Acceleration, however, improves significantly, with a 0-60 time of 5.4 seconds being the norm, according to one road test of this potent mill. A center-mounted mechanical differential helps manage both the new-for-2011 535i xDrive and 550i xDrive AWD traction action. 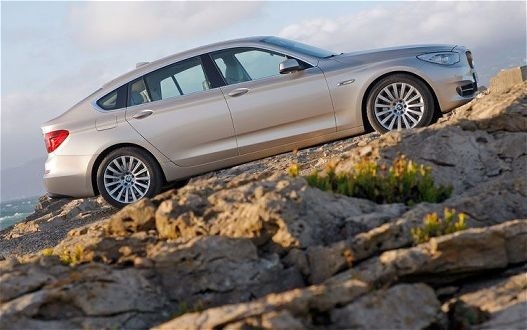 Virtually all reviewers are effusive in their praise of the 550i’s V8 acceleration, though the I6 is noted as being no slouch either, and all this despite the fact that the 5 Series Gran Turismo is considerably weightier than its 5 Series compatriots. According to one review, a slight hesitation is noticeable on takeoff with the V8, but it is also noted that this hardly presents a problem when the twin-turbocharger kicks in and things start to get interesting. The 8-speed auto-manual transmission is described by most reviewers as responsive and well-matched to the respective powerplants. A few, however, note a certain quirkiness in shifting when encountering crowded downtown streets. Reviewers additionally note that the exhaust note from both engines is refined and throaty, as well as being audible, for the most part, only to those on the outside looking in. Though equipped rather traditionally, suspension-wise, the 2011 5 Series Gran Turismo does boast BMW’s highly touted Adaptive Drive technology. This state-of-the-art system complements the four-wheel independent suspension, double-wishbone front suspension, front and rear stabilizer bar, and multi-link rear end with four settings, Normal, Comfort, Sport, and Sport +. In Normal mode, reviewers find a significantly less plush ride than is expected of a luxury automobile, though it’s far from truck-like. In any case, drivers may wish to select the Comfort mode with its friendlier steering and softer suspension that mitigates bumps and ruts as well as providing a measure of maneuverability in tight spaces. However, if a bit of driving pizzazz is desired, the Sport or Sport + modes can be dialed in, where the suspension tightens considerably with a corresponding up-torque of the torsion bars, tighter shift points and quicker throttle response. All 5 Series trims are equipped with standard 18-inch alloy wheels mounting low-profile performance tires. Most reviewers claim that this arrangement is not exactly road-friendly, but that the Adaptive Drive system admirably diminishes the traditional harshness, especially in Comfort mode. Alas, reviewers are, in the main, disappointed with the Gran Turismo’s Brake Energy Regeneration system. Virtually all note that when backing off the gas pedal at low or moderate speeds, a distinct lurch disturbs what should be a smooth coasting effect. The brakes themselves, however, are described as more than adequate to the task in emergency situations. In traditional Beemer style, the 5 Series Gran Turismo offers far more than run-of-the-mill comfort and conveniences. Standard amenities for the 535i, besides the power sunroof, include leather upholstery, eight-way power-adjustable front seats with power lumbar support, remote power door locks, four one-touch power side windows, power-adjustable heated outside mirrors with reverse-tilt feature, telescoping tilt-wheel steering and BMW Assist with driving directions, roadside assistance and Bluetooth-based hands-free communications technology. Some standard posh touches include memory settings for two drivers and dual-zone front climate control, as well as a leather steering wheel and leather, wood, and alloy door, console and dashboard accents. Entertainment is handled by a 205-watt single-CD player with 12 speakers, including two subwoofers. 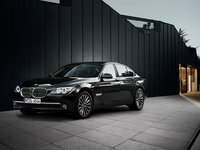 BMW’s iDrive system, allowing hands-free operation of many electronic gadgets, is also standard. The 550i trim level, meantime, adds remote sunroof operation, voice-activated navigation with RealTime traffic, a universal remote garage door opener and auto-dimming mirrors inside and out. Options for both trims can be found either individually or in a veritable cornucopia of packages. Standalone options include Nappa leather upholstery, voice-activated DVD navigation (in the 535i), Integral Active Steering (where all four wheels are turned for easier maneuvering), four-zone climate control, active cruise control, head-up windshield instrument display, heated front seats, rear-seat entertainment, iPod and USB adaptors, and satellite radio. The Cold Weather Package adds a heated steering wheel and heated outboard rear seats to the standalone heated front seats, while the Camera Package features top-mirror-, side-, and rear-mounted camera systems all feeding a dash-mounted display screen. The Driver Assistance Package boasts blind-spot detection sensors and a Lane Departure Warning alarm, with the Premium Sound Package offering 600 watts of power, a 6-CD changer, and a nine-channel amplifier in addition to iPod and USB connections. After a breath, the list of available packages continues with the Sports Package, featuring 20-way adjustable front seats and 19-inch multi-spoke alloy wheels, while the Convenience Package sports power rear hatch operation to go along with a universal remote, keyless entry and auto-dimming mirrors offered individually. The Dynamic Handling Package, meanwhile, features variable electromagnetic shocks and actuated stabilizer bars, with the 2-place Luxury Rear Seating Package and the Active Ventilated Seat Package offering ventilated rear seats, power rear sunshade, a rear center console and four-way power-adjustable seats, and front ventilated seating with active contour adjustment, respectively. Reviewers seem mixed in their assessment of the iDrive system, with some claiming a daunting learning curve to maximize efficiency and others noting that it raises hands-free technology to new levels. Plush cabin materials, high-grade leather, decadent roominess, and classy accents have most reviewers praising this hatchback’s interior ambiance, though a few note an inconvenient placing of some cupholders interferes with efficient climate-control operation. Also, rear visibility is somewhat compromised to the direct rear and rear sides due to the rake of the hatchback design. Of course, the effective but pricey Camera Package goes a long way toward alleviating this situation. Notwithstanding its hefty body weight, the 2011 5 Series Gran Turismo sports a truckload of standard safety features. Four-wheel antilock braking (ABS) with electronic brakeforce distribution and emergency braking assistance, as well as traction and stability control, are complemented by dual side-mounted airbags, front and rear head airbags, and front head restraint whiplash protection. Daytime running lights, front fog/driving lights, and self-leveling xenon high intensity discharge (HID) headlights help in night driving and in bad weather, while a remote antitheft alarm and BMW Assist’s Emergency Service, Airbag Deployment Notification and Stolen Vehicle Tracking features will generally relieve ones anxiety in unfamiliar territory. Optional safety equipment includes Night Vision with Pedestrian Detection, as well as Active Roll Stabilization in the Dynamic Handling Package, blind-spot and lane-departure warnings in the Driver Assistance Package, and active front head restraints with the Sport Package. The National Highway Traffic Safety Administration (NHTSA), now a bit more in touch with reality, awards the 2011 5 Series Gran Turismo its best five-star designation overall, with four stars in frontal crash tests and five stars in side impact and rollover testing. The Insurance Institute for Highway Safety (IIHS) gives the 2011 5 Series lineup as a whole its best grade of Good in all tests: front impact, side impact, and roof strength. More than a few owners of the 2010 and 2011 5 Series Gran Turismo wonder why some professional reviewers pan its indistinct target market, saying it fits those torn between a luxury sedan and a luxury crossover to a tee. There are, however, those who have complaints with some aspects of this luxurious loner, chief among them the disconcerting hesitation noted on accelerating from a dead stop. Some handling issues also plague a few owners, while others find cabin storage to be a bit lackluster. Finally, this hefty hatchback’s price is somewhat of a concern for owners, with many griping that they ought to get more standard features for the dollar. Positive owner feedback, by far the predominant opinion, notes seat comfort, cabin room, and an abundance of techno-endowments, with the correspondingly improved iDrive interface technology, to be especially praiseworthy. The Gran Turismo’s adaptive suspension system comes in for special praise from owners for its ride comfort in the Normal and Comfort modes and for its spiffier handling in the Sport and Sport + modes. 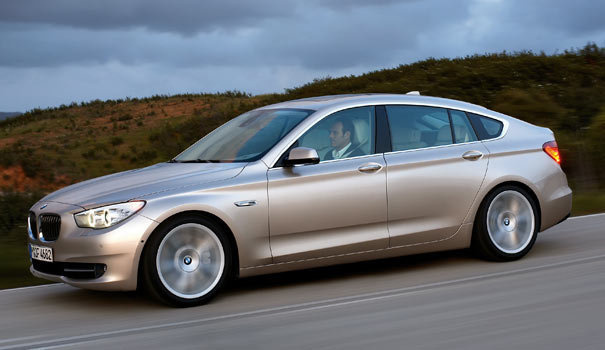 What's your take on the 2011 BMW 5 Series Gran Turismo? How many speakers on each. How Is It Driving A Bmw 535i Gran Turismo?